What is the deal with homemade donuts? Recently, every time I have been to a store with baking supplies, I have seen more and more home donut-making items. Pans, mixes, recipe books, icing, etc, for both baked and fried donuts. Meanwhile, I do not know a single person that makes their own donuts. Donuts are in that rare category of baked goods that taste better when purchased at a store. Let’s admit it, Dunkin and Krispy Kreme do a pretty good job. And there’s nothing like the aroma of an apple cider donut at an orchard on a crisp autumn day. Making your own donuts is highly problematic. First, the baked kind taste terrible. They are basically little cakes with holes in the middle. But they are missing that true donut essence. So they have to be fried. 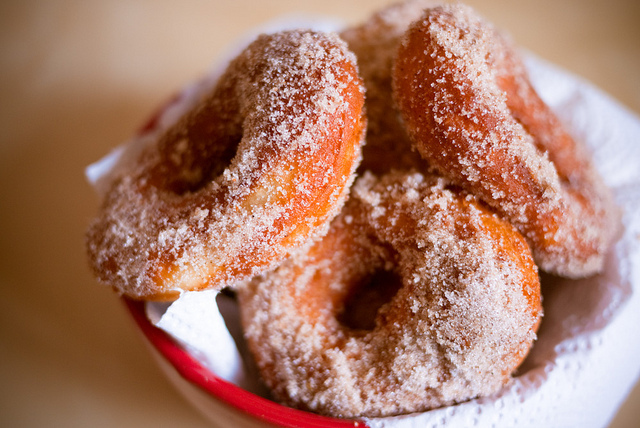 But few people have the right pan, deep fryer, large quantities of oil, or complete lack of health concerns that making your own fried donuts require. The other issue with homemade donuts is that people like variety. If you are bringing your homemade donuts to a function, are you going to have a mixed plate with chocolate, vanilla, and French cruller? It’s just too much work. I am guessing this recent trend in homemade donut paraphernalia is part of the do-it-yourself, back-to-basics style of living the recession has inspired. And that’s ok. But me? I’ll drive to the local Dunkie’s, thank you very much. Photo used via a Creative Commons License from Flickr user stëve.